From left to right are Gallia Commissioner Harold Montgomery, Gallia County Administrator Karen Sprague, Meigs Commissioner Randy Smith, Gallia-Meigs Community Action Housing Program Associate Diana Roush, Meigs Commissioner Tim Ihle, Gallia Commissioner Brent Saunders, Gallia-Meigs Community Action Executive Director Tom Reed and Gallia Commissioner David Smith. 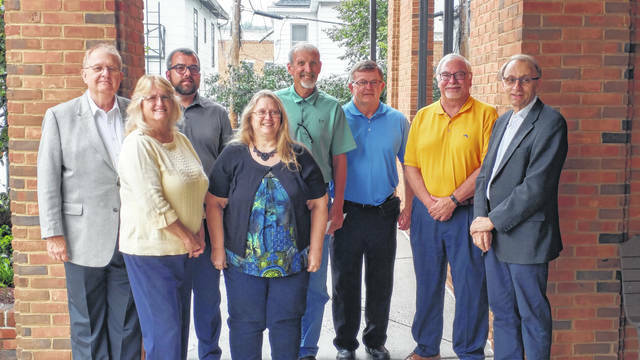 GALLIPOLIS — The Gallia and Meigs County Boards of Commissioners announced the receipt of an $800,000 CDBG grant for their joint 2018 Community Housing Impact and Preservation Program, Thursday. The CHIP program is funded through the Ohio Development Services Agency, Office of Community Development utilizing OHTF (Ohio Housing Trust Fund), CDBG (Community Development Block Grant), and HOME (Federal HOME Investment Partnership Program) funds. Gallia-Meigs Community Action Agency administers this program for the County Commissioners. The grant is available to LMI (low-to-moderate income) residents of Gallia and Meigs County who own their home and need health and safety repairs or for first-time homebuyers wishing to reside in Gallia or Meigs County. Meigs Commissioners Tim Ihle, Randy Smith and Mike Bartrum and Gallia Commissioners Harold Montgomery, Brent Saunders and David Smith applauded the effort. Both counties applied for grant funding jointly. Activities which can be applied for through this grant are as follows: home repair, private owner rehabilitation, and homeownership. Grants are available for single family residential dwellings which are owner-occupied and whose total household income does not exceed maximum income limits. Assistance is available for emergency repairs, which may include furnace replacement, roof replacement, electrical repair, septic systems, handicapped accessibility and elimination of other health and safety issues. Eligible applicants are selected on a first-come, first-served basis in order to serve the neediest families. Grants combined with direct and deferred loans are available for single-family residential dwellings which are owner-occupied and whose total household income does not exceed moderate-income maximum income limits. Each home who receives assistance will be brought up to the Office of Community Development’s Residential Rehabilitation Standards. Those applicants eligible for this program agree to a deferred mortgage to be place on the property for a period of 5 or 10 years depending upon funding source and amount used to rehabilitate the property. Eligible applicants are selected based on a priority rating in order to serve the neediest families. The Home-ownership Program will be offered county-wide to all eligible persons who are below 80 percent of the county median income. The purpose of this program is to assist residents in purchasing an affordable unit. The applicant must be able to obtain financing through a qualified financial institution. We will accomplish this by providing down payment assistance for the purchase of the unit and addresses health and safety issues with the home to be purchased. We will require the applicant to have a minimum of $1,000 towards the purchase, meet HOME down payment assistance requirements, and participate in a home buyer Education course. Those applicants eligible for this program agree to a deferred mortgage to be place on the property for a period of 5 or 10 years depending upon the amount used to rehabilitate the property. This mortgage will be forgiven at 0 percent interest for the term of the mortgage. Income guidelines used to determine eligibility for the CHIP program come from the Housing and Urban Development Section 8 program income guidelines as follows: one person in a household can qualify if they make under $34,400, two persons under $39,300, three persons under $44,200, five persons under $53,050, six persons under $57,000, Seven persons under $60,900 and eight persons under $64,850. To apply contact Gallia-Meigs Community Action Agency: 740-367-7341 ext. 125. The 2018 CHIP grant local matching funds totaled $189,833.